Tahitian cultured pearls are best viewed in immaculate, white dishes. Under soft lights and without interference, they have a radiant presence, showing multiple colours and the orient that they patiently built for months. People easily fall under the spell of Tahitian cultured pearls, but it can be difficult to select a favourite. To do so, listen to your heart. If still in doubt, the criteria like colour, shape, surface, size and radiance should help. Pearls form as they wish, just as keishis do, the small pearls that reject the nucleus and keep only graft tissue around which aragonite aggregates. Tahitian cultured pearls show many shapes, usually divided into five categories: round / semi-round, oval / button, drop, circled, semi-baroque and baroque. While round pearls long have been the buyers’ favourites, other categories attract more and more designers who draw inspiration from the pearls’ original, natural shapes to create unique jewellery. Although commonly called black pearls, Tahitian cultured pearls offer a wide range of colours. In their natural state, they show infinite unique shades: cherry, cream, peacock, green, blue, grey, white and more. Choosing is, above all, a matter of personal taste. The size is measured in millimetres, the largest pearls being the rarest and most sought after. Most Tahitian cultured pearls measure 8-14mm. Very exceptionally, some exceed 18mm and are considered extremely rare treasures. The surface quality of Tahitian cultured pearls can be appreciated by naked eyes. As with all natural products, some pearls show surface imperfections. 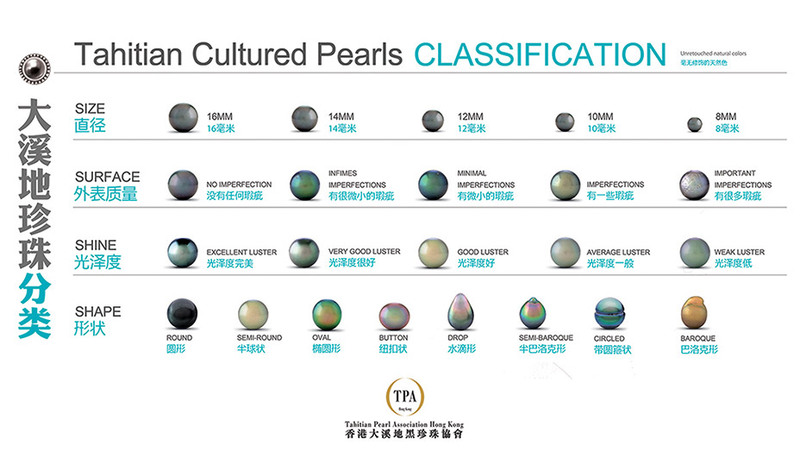 There are five pearl categories: Top Gem (perfect quality, no defects); Category A (tiny, almost invisible, blemishes); Category B (very light imperfections); Category C (marks on less than two-thirds of the surface); and Category D (relatively important marks). A pearl’s radiance consists of its lustre and orient. The lustre, or shine, is determined by the degree of light reflection on its surface. Beautiful lustre means that light is totally reflected, resulting in a mirror effect. The weaker the lustre, the duller the effect is. The orient determines the iridescence of a pearl, which comes from the decomposition of light through the layers of nacre. Beautiful orient results in a soft rainbow effect, similar to that seen on soap bubbles. Generally, the bigger a pearl’s diameter and the rounder its shape, the higher its value, but exceptions exist. The value of a large, lower-quality pearl may be less than for a smaller, blemish-free one. 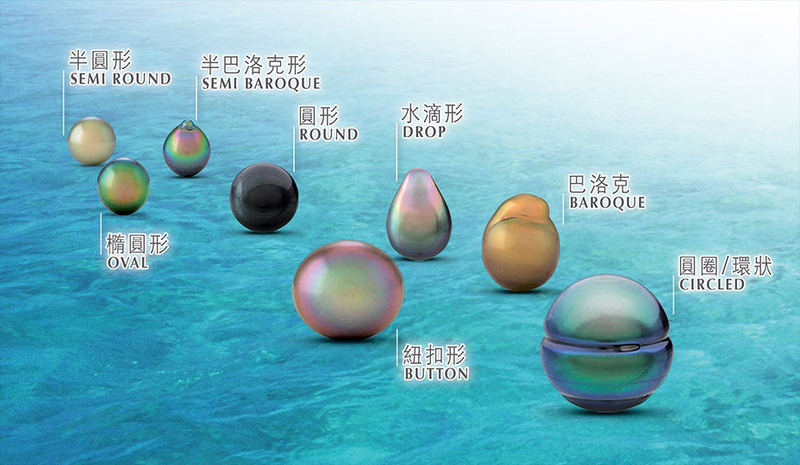 Regardless, the color and radiance criteria specific to Tahitian cultured pearls remain the most decisive considerations to experts. Once removed from their shells, Tahitian cultured pearls require tender loving care. Such gems rehydrate on skin contact, so wearing them often is essential. Any acid aggression can prove fatal to pearls. The big enemies to pearls are chlorinated water, perfume and hairspray. Tahitian cultured pearls should be wiped regularly with a soft cloth.